Every quarter, “earnings season” comes around and gets us financial nerds excited. This is the recurring time period when public companies around the globe announce results for their latest financial period, whether it be quarterly, semi-annually or annually. The releases for this latest quarter usually happen between July and August for the months prior to the end of June i.e. half-way through the year. Different companies have different fiscal periods, of course, but this is the general timetable and it makes for an interesting time since it’s the best way to get a handle on how well a company is performing and also gather reactions from investors, analysts and industry commentators. 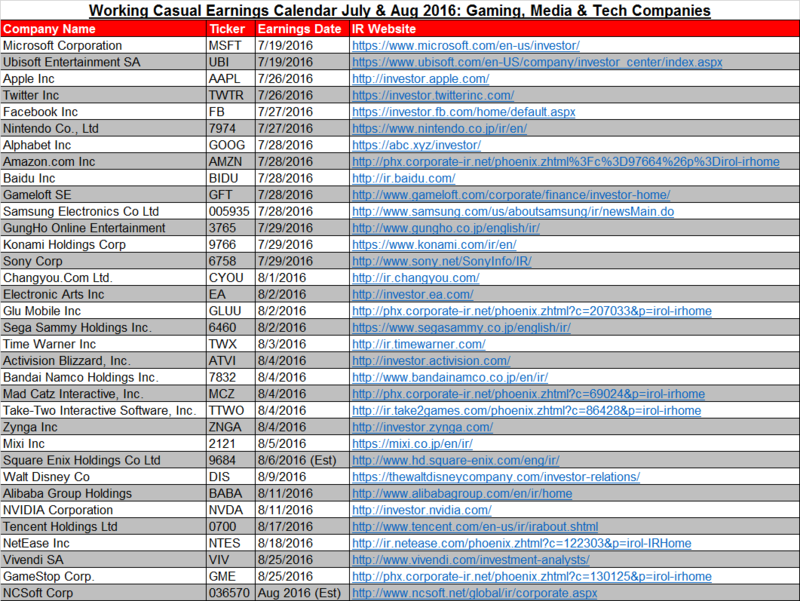 In “celebration” of our latest earnings period, I’ve compiled a list of select companies in the gaming, media and technology industries and the dates on which each will reveal their latest results. See this full list as follows. This list has been edited as of 8/4/2016, with updates to some that were “estimated” previously. These are NVIDIA, NetEase, Mad Catz and GameStop. Still unsure on Square Enix and NCSoft, will update accordingly! This is sorted based on timing, and I’ve included a link to each firm’s investor relations site which is where you can go of course to read the full announcements. Public companies will also have an earnings conference call where executives and key personnel announce the results formally and take questions from analysts covering their stock. This is actually my favorite part of the earnings ritual, in particular the analyst Q&A sessions, as the calls offer even much more insight into how a company is doing. Sometimes executives will provide facts or statements outside of what is in the press release or filings, and it helps provide further context for results and also it’s revealing on who is running the company. And there are even times when an executive can’t answer one of the questions, or dances around the real answer, and it’s fun to see the back-and-forth between these parties. A couple highlights are today both Microsoft Corporation and Ubisoft Entertainment SA will reveal their latest results, then next week the world’s largest company Apple Inc will be reporting. Nintendo Co., Ltd. will also report next week, after the exceptional initial success of its Pokemon Go venture with The Pokemon Company and Niantic Labs. I wouldn’t expect to learn how much this new mobile game sensation is contributing to revenue just yet, as it’s only been out for a week and a half (hard to believe, right!). Still, Nintendo will likely address the game in some capacity. Technology manufacturer Samsung Electronics Co Ltd is late next week, as is huge retailer Amazon.com Inc. These companies, in addition to Apple, are often a sort of barometer for how consumers are acting on a global scale. Lastly, in August, we’ll hear from Tencent Holdings Ltd in its first financial release after acquiring Finnish developer Supercell for $8.6 billion. The company is now the world’s largest public gaming firm by revenue, and serves as a benchmark to seeing how well the international mobile games market is faring in particular. Want to hear more about the releases as they happen? I often try to provide perspective and figures/numbers on Twitter when I’m not writing here, so visit me and shoot me a tweet! I should have a write-up on a couple of these companies soon, in particular both Activision Blizzard, Inc. and Nintendo. Until then, did I miss any companies you are following? Please let me know and I’ll add them accordingly. Sources: Company Investor Relations Websites, Wall Street Journal, Newzoo. Which Indie Video Game Has More Sales Potential: Mighty No. 9 or No Man’s Sky? Introducing: Working Casual Email Subscription!